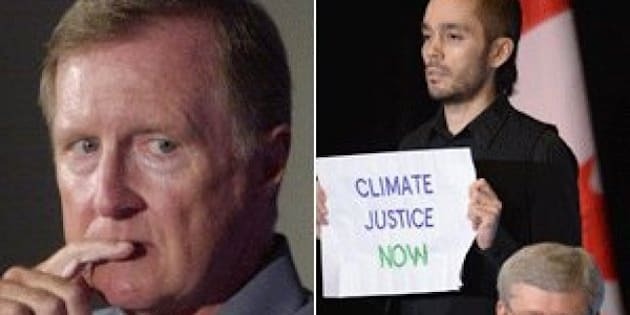 Conservative Senator Bob Runciman sees nothing funny about the fact that two sign-wielding, climate change activists were able to easily sneak just a few feet behind Stephen Harper at an event this week. In fact, Runciman thinks those activists ought to be facing charges, even though they didn't so much as lay a finger on the prime minister. Vancouver police confirmed Tuesday that Sean Devlin and Shireen Soofi won't be charged for crashing an event hosted by the Vancouver Board of Trade on Monday. The pair dressed as members of the catering staff and climbed onto a stage next to Harper, holding signs which read "Climate Justice Now" and "Conservatives Take Climate Change Seriously," with the words crossed out. The pair was promptly removed by security, with Harper joking, "It wouldn't be B.C. without it." But Runciman, a former solicitor general of Ontario, released a statement Wednesday saying a lack of "effective laws" trivializes a real threat to the prime minister. "There's no doubt the RCMP Protective Unit needs to be asked some very pointed questions, especially when one of the individuals on stage was -- or should have been -- on an RCMP lookout list," Runciman said. "However, an equally important question is how people can subvert security measures, pose a potentially life-threatening danger to the country's Prime Minister and walk away scot-free and smiling? That's got to be addressed." Devlin also disrupted an Enbridge Northern Gateway Joint Review Panel in Vancouver last January. The senator says the incident with Harper highlights a need for new laws to prevent "future improper attempts" to gain entry to events where designated persons like the PM or Governor General are present. Runciman says in the release that he aims to introduce private member's legislation in the Senate. "People who sneak into these kinds of events, using phony ID, impersonate others, or conspire with others to do the same, should face indictable offences with serious fines and/or imprisonment," he concludes. In an interview with CBC News Monday, Devlin said he wasn't a security threat to Harper, merely a man trying to make a point. "I wasn't there to hurt the prime minister today," he said. "I was there to communicate a message about people who I believe his policies are hurting." What do you think? Should the protesters — or any else who may try something similar — face charges? Tell us in the comments.